It was discovered over 50 years ago in a picturesque and peaceful part of Hampshire. 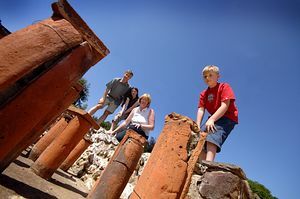 The Roman Villa once stood at the centre of a large farming estate and its history spans the period from the Iron Age to the 5th century AD. You can walk around the remains of the villa which include bath houses, part of the underfloor heating system and the best preserved mosaics. The site museum displays many of the fascinating objects found on the site. There is also a well stocked souvenir shop. From the North and South: Leave the A338 at Fordingbridge. Follow the B3078 signposted to Sandleheath. From Sandleheath crossroads, follow brown sign to Museum and car park. From the West:Follow brown museum sign from A354 through Rockbourne Village to Museum and car park.